This truly authentic addition is guaranteed to attract attention, distinguish your work and demonstrate your desire to get your period project absolutely right. These discs are quality, datestamped blank reprints which are reproduced with the kind permission of Her Majesty's Stationary Office, under licence number C02W0005643. The color and style is correct for each year and they have the period reverse and tear off text. For just a little extra..........well............$7 actually !! Camilla (our tea lady) will get out her vintage pen set and professionally complete the disc for you in the style of the era. 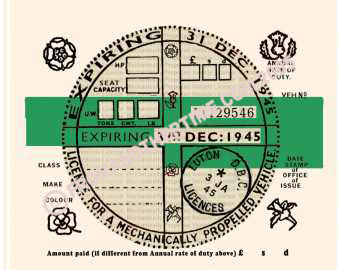 Click here to see our mate Dan Gumpworm's guide on how to fit a tax disc to your Car, Motorcycle or Scooter ................. and the pitfalls to avoid.